Mercedes-Benz: one of the oldest and most prestigious automobile manufacturers in the world. A brand of cars that stand for luxury, safety, high standards and engineering excellence. If imitation is the sincerest form of flattery, Mercedes-Benz is the cream-of-the-crop, with its innovations appearing in many other vehicles throughout the industry. Considered by many to be the finest automobile ever built, Mercedes-Benz is truly an incredible piece of machinery and technology. Ensure the best driving experience and most prolonged life of your Mercedes-Benz engine by working with European Auto Tech’s master technicians. Expertly trained in the service and repair of Mercedes-Benz vehicles, European Auto Tech’s professional and courteous staff has the experience needed to maintain the superior performance and handling of your Mercedes-Benz vehicle in Tucson. 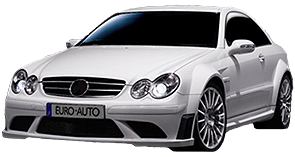 European Auto Tech proudly offers industry-leading factory-level service and repair of all models of Mercedes-Benz vehicles. Our expert technicians have serviced and repaired nearly all models of Mercedes-Benz, and have the experience, expertise and resources to ensure the best performance and longest possible life of your Mercedes-Benz vehicle. The following are some of the most common services and repairs performed on Mercedes-Benz engines in Tucson by European Auto Tech’s master technicians. Vehicles with electronically controlled transmissions have a plastic sleeve where the wiring for the transmission control unit connects. The seals in this sleeve often start to leak. Transmission fluid leaks externally and can reach the ground in some instances. The bigger issue with this leaking sleeve is that the transmission fluid will actually wick up the wiring harness into the transmission control unit, damaging the control unit, which makes for an expensive repair. This is a repair that European Auto Tech can perform for you immediately, at first signs of leaking, to prevent further damage and avoid costly repairs down the road. The most common problem in Mercedes-Benz from about 1998 on has been the crankshaft position sensor. The engine control unit (M.E.) needs to know the position and speed of the crankshaft. With no signal from the crankshaft position sensor the control unit shuts off the ignition and fuel injectors leaving you stranded. European Auto Tech technicians have the experience to remedy this issue with your Mercedes-Benz long before you find yourself stranded on the road. While a very good system when it is working, common problems include leaking pressure hoses, leaking pressure switches, failed pressure accumulators, non-functioning valve bodies and a failed pressure pump. While other shops often overlook maintenance of this system, European Auto Tech can save you time, frustration and money while prolonging the life of your suspension by performing proactive maintenance and visual inspection of the system. Flushing the ABC system periodically helps to lengthen the service life of the rest of the components, and European Auto Tech is here to help you. When the air system sags in one or more corners on your Mercedes-Benz, the vehicle will often not achieve ride height after starting engine. This is due to the structure of the system; it uses air bags in place of coil springs at all four corners of the cars suspension. The front air bags can often be repaired with a new valve kit. If the vehicle needs a front air bag replaced we do have options, including a better-built aftermarket air bag/strut assembly. If the rear air spring fails on some chassis it requires removal of the entire rear suspension of the vehicle, which can be very time consuming. Fortunately, we now have lower-priced, superior options that are not nearly as labor-intensive. Though this system can present a variety of issues, the most common problem with the ESP traction control and the BAS brake assist system is the brake light switch. Your brake lights still work but part of the switch has failed and the ESP/BAS control unit illuminates the warning lights. European Auto Tech can remedy this issue for you. Maintaining the long-life and superior-performance of your Mercedes-Benz is our priority. Upon diagnosing an issue with your Mercedes-Benz, our technicians will outline in as much detail as possible what the issue is and what repairs we recommend, along with an overview of the important considerations of each of your options. In explaining the issue clearly and providing an overview of your options and the associated risks and benefits, our goal is to provide you with superior service and the most affordable long-term solution for maintaining the overall health of your Mercedes-Benz automobile. We will always inform you of the issue with your vehicle and discuss all options with you before performing and repairs. When it comes to Mercedes-Benz service, we have you covered. Our knowledgeable staff and fully equipped shop will provide you with the most comfortable Mercedes-Benz experience you can have. We will take care of your Mercedes-Benz as if it was our own. Our service includes anything from routine maintenance to complete and accurate mechanical and diagnostic repairs. We offer a comprehensive buyer’s inspection of pre-owned Mercedes-Benz vehicles. We perform a thorough check of major systems, body and chassis, suspension, brakes and drive-train. We then compile a complete report for the buyer giving the buyer a sense of what expenses may be incurred in the near future, how well the car was maintained and the overall condition of the vehicle, allowing you to make the most informed Mercedes-Benz purchase decision. We can perform your required or necessary maintenance services while your Mercedes-Benz is still under factory warranty. We use factory approved parts and lubricants. We will stamp your maintenance book. You are not required to take your Mercedes-Benz back to an authorized dealer for services or maintenance services that you are required to pay for. Contact us for details. Use the form below, or contact us by phone, to schedule an appointment to service, repair or inspect your Mercedes-Benz vehicle at our 1st Avenue shop in Tucson, Arizona. Let our master technicians and courteous staff make you our newest in a long line of satisfied clients.